The public is cordially invited to this free, Lunch and Learn presentation scheduled for Tuesday, September 19, 2017 from 12:00 to 1:00 PM. The Carnegie Center for Art and History is pleased to welcome John Riley as our guest presenter. 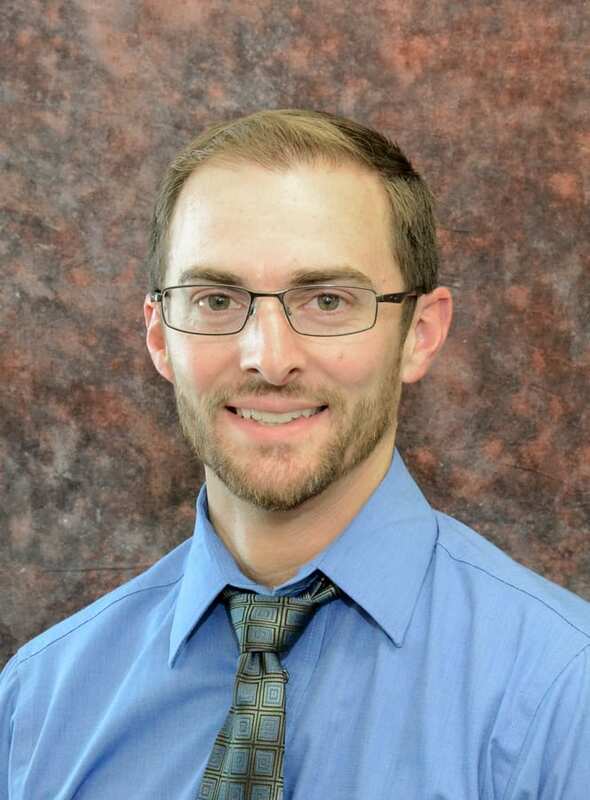 Mr. Riley is a mechanical engineer who earned his degree from the University of Louisville’s Speed School of Engineering and works for Samtec U.S.A., one of southern Indiana’s most important and innovative manufacturers. Recently, Southern Indiana Business magazine recognized John Riley in their article on twenty leaders less than 40 years of age to watch in our community. Riley’s presentation will be on what a “makerspace” is and how this growing movement in atypical education is helping people of all ages envision the possibilities of what can be created using today’s technological tools. Despite a recovering economy, it is often difficult for industry to find all the skilled labor required to run a competitive manufacturing business in the 21st century. Industry has recognized that vocational opportunities for young people exist, but the traditional shop and home economic classes in high school that were once educational mainstays and helped drive vocational programs are not as prevalent as they once were. The needs for a skilled workforce are still there, but earning a degree has become the accepted path to success for many young people. This has created a vacuum that limits our area’s manufacturing businesses from attracting and retaining the skilled, technologically-talented workers needed to improve the living standards of our community. Seeing a need to promote STEM (Science, Technology, Engineering, and Math) education and general creativity within our community, John Riley had the idea of creating a not for profit, Maker Mobile ( a 32 foot trailer filled with the latest technology including 3D printers, laser cutters, and more) and make this resource available to inform and inspire schools and interested groups. The funding for this portable makerspace came from the BlueSky and Ogle Foundations of southern Indiana and was Riley’s first foray into makerspaces. 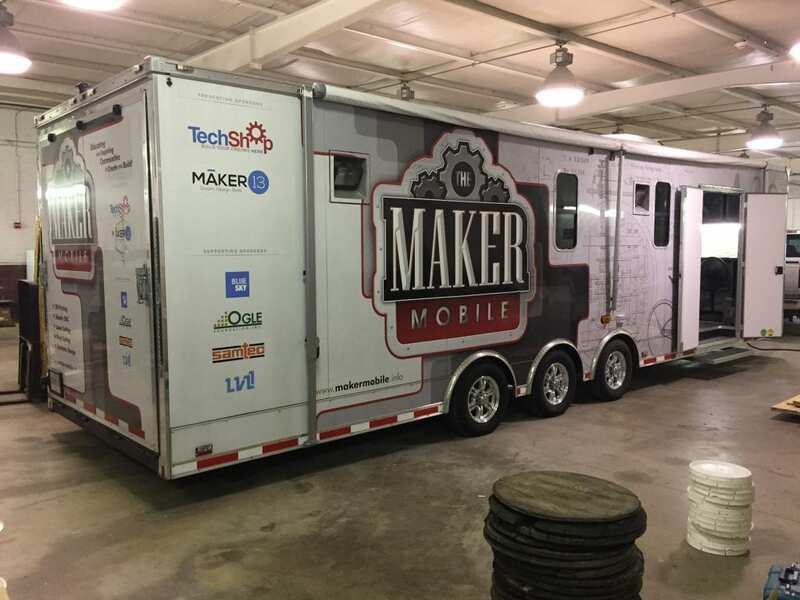 The Maker Mobile housed at the Maker 13 space in Jeffersonville, IN. Elaborating on his original idea, John Riley along with business partners next created a for-profit makerspace called Maker13 which is located in Jeffersonville, IN. Maker13 is filled with 3D printers, laser cutters, a fully stocked wood shop, sewing machines, embroidery machines, welding equipment and a knowledgeable and friendly staff. Maker13 is a resource for the community and regularly holds paid workshops and memberships where instructors teach how to safely operate the latest, powerful technologies and what can be made with them. It would be very possible to take an idea into this makerspace and with a little training start a small niche business. The goal is to empower people through providing access to technology and know-how. Although the original impetus was to attract young, less traditional learners to manufacturing, a growing national movement towards makerspaces is occurring. Libraries in particular have become very interested in creatively combining their traditional services with what makerspaces can offer. For lifelong learners, retirees, and artists…makerspaces provide access to specialized tools and a space designed to use them in. If you would like to learn about Maker13 and see a 3D printer in action than John Riley’s presentation is for you. Here is the link for the Maker13 website: https://maker13.com/. Lunch and Learn is a free program, however, registration is requested. If you would like to attend, please email Delesha Thomas at dthomas@carnegiecenter.org or call the museum at (812) 944-7336. Bring a lunch and the Carnegie Center will supply beverages. This presentation will be held in the Jane Barth Anderson Meeting Room located on the museum’s lower level. We hope to see many of you on Tuesday, September 19 at 12:00 PM.